The Mercury of January 14, 2009, reported that a fire had broken out at the Royal hotel the day before, resulting in the evacuation of a hundred guests and staff. The fire apparently broke out on the third floor in a linen storage room. 7 eThekwini Metro fire tenders attended the scene and soon contained the fire. I am personally amazed that, given the shortages of staff that the fire department is currently experiencing, they could actually send out seven fire engines. The paper also reports that on the previous day, the last section of the Moses Mabhida stadium. 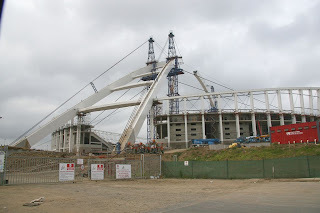 The arch, costing R448 million, was nearly complete when, at 3:45 p.m., the 60 tonne final piece was hoisted into place. The arch is made up of 96 separate pieces and at its apex towers over 100m above the playing surface. The arch is presumably mainly decorative but it will support the Teflon coated glass fibre stadium roof which will be apparently unique in the world. It was announced during the week that city management were going to go out on the streets to help clean the new street name signs which had been defaced by vandals objecting to the street reanming in their areas. The Mercury of Friday, January 16, 2009, reported that many of these officials had taken some flak as they worked. Mayor Obed Mlaba said he had been confronted by two ratepayers including one old lady who said that what they were doing was nonsense and another resident, known as Alistair, who said the street then shouldn’t have been changed in the first place and that spray-painting the street names was and vandalism, it was people protesting against the enforced changes. Dear Obed and Mike, I noticed you both very hard at work in my ward in Durban North cleaning the defaced street signs (the same ones you forcibly imposed on the Durban North community despite overwhelming community rejection). You obviously so busy keeping the very relevant Swapo sign with your ANC baddies that you both failed to notice the graffiti on all the other municipal infrastructures in the area which has not been cleaned for years. You also, no doubt, overlooked the overgrown municipal verges and the weeds in the road, drains and pavements which, despite repeated requests to your parks department, remain unattended to. Your hard slog would have meant that you were also likely to miss the near-fatal accident which took place in Danville Avenue on the same morning. You will remember that this is the road where the residents and I have been pleading for some form of traffic calming to be implemented for the past two years with no success. There is always the same excuse: no funds. It appears you guys have used all the funds on fancy projects, seven BMWs, overseas trips and expensive tracksuits for your councillors. I was, however; glad to notice that you brought the luxury mayoral 4×4 along. You would have needed it if you’d wanted to visit any one of your municipal parks in the area, because the grass hardly gets cut and there is lots of litter which never gets collected. I am sure that this was not just a cheap publicity stunt and will be ongoing, so the next time you decide to come and do some work in Durban North, I would be grateful if you could give me a call to meet you on the site. This will enable me to provide you with the long list of basic municipal functions which, under your leadership, failed to get done. With the exorbitant rates which you’ve passed on to the Durban North residents I think we all deserve to see you both getting your priorities right and doing something constructive for a change. By the way Mr Mayor; your press statement urges the public to report illegal posters. Two months ago I reported whole bunch of illegal ANC rally posters which had been put up across the city; perhaps you could do some follow up because for some reason Michael won’t seem to come back to me on the progress. 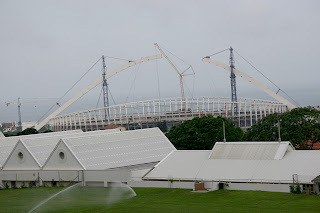 Apart from the street naming issue, reporter Coleen Dardagan has a story on the Moses Mabhida stadium saying that, while the residents of Durban are looking forward to using the new stadium, it’s also time the municipality told them how much they are in for. She quotes DA leader John Steenhuisen, again, saying that the city’s failure to release the financials of the stadium since July last year should set alarm bells ringing. She also says that city manager Michael Sutcliffe had promised the Mercury an interview in August last year to discuss the costs of the stadium, but that nothing had yet materialised. Dardagan says that it is concerning that no one really knows what we are in for once the 2010 World Cup has come and gone, what the maintenance costs will be, and how much the budget has been overrun. She said she believes it’s time the city drew its citizens into its confidence and let them know. The two issues covered in this post are ongoing but they show up the leadership style of our new masters perfectly; unaccountable. autocratic and obdurate. City councils and management from the past will be remembered for their support of of apartheid but at least nobody will be able to point a finger at them and say that the city fell apart while they sucked the cash tittie and scored cheap political points. We had high hopes that our society would improve when we voted “yes” in the referendum but all that’s really changed is that there is a new elite and one, moreover, that is so concerned with its enjoyment of the trappings of power things like maintenance are forgotten. 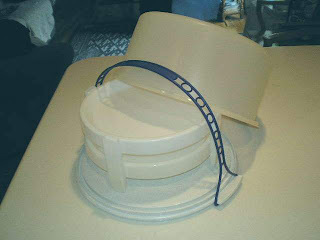 Or does the new Moses Mabhida stadium look like a Tupperware cake taker. See the pictures below this one. I was out and and about on 21 December 2008 and took this picture. The ends of the arch over the stadium seem about to join in the middle. Last Sunday, which was December 21, 2008, I had a bit of a sad experience. With a a couple of passengers, I had occasion to drive from the Morningside, Burman Bush area, over to the Botanic Gardens, and from there to Essenwood Road, and then down through town to the Point area and back to Morningside. The town has a dilapidated air with pavements which were unswept, and had not been for many moons, judging by the size of the weeds. Street furniture was badly in need of painting, potholes were proliferating in the roads and it was not only the busy downtown areas that are affected in this way, but even the leafy streets in the suburbs were looking down at heel and badly in need of attention. To say that Point Road, around the the intersections of West and Smith Street is looking squalid, is to be guilty of a gross understatement. The beachfront is our crown jewel, which tourists should be paying big bucks to visit, and yet it is being ruined, and I don’t know the cause. Is it greedy building owners, a huge influx of poor people to the area, crime? What? Whatever factors are at work, they must be identified and sorted or we are going to end up as some sort of coastal cloaca. Ever fewer people are going to want come here. Having travelled a fair way through town on Sunday, it was inevitable and that we would come across another problem which is plaguing Durban at the moment. The matter is, of course, the fact that there are so many malfunctioning traffic lights and, although I can’t accurately remember exactly how many were not working, it was more than a double-handful. By a strange, well perhaps not so strange, coincidence, the Sunday Tribune of the same day, December 21, carried a story headlined “Berea Road’s killer corners”. In the story, it was reported that faulty traffic lights have been causing havoc at a number of locations in Berea Road. These are the bridges at Essenwood Road and Musgrave Road and the robots have apparently not been working for three weeks. At least 30 accidents were reported from those locations in the last three weeks. In spite of this ongoing problem, City Police pointsmen had not been deployed in the area, which is one of the most busiest in the city. There is a picture heading the story which shows absolute chaos with cars going every which way trying to get through the intersection. An onlooker reported city policemen on a bridge over Berea Road operating a speed trap, but totally unconcerned with traffic chaos at occurring not a couple of yards from where they sat. In the Natal Mercury of December 22, 2008, there is a reader’s letter which notes that city management, because they live here, must pass these intersections and others like them every day, and yet they do nothing. The reader is is quite right to raise this point and you can’t begin to understand how these people can neglect their own home in such a fashion. The Sunday Tribune article of the 21st, said that a contractor was responsible for repairing the traffic lights and the questions should be asked why the city’s own staff is not being used for this task, and why, failing that, the contractors are not being supervised adequately. The Durban streets that we travel in every day are not yet looking quite like the streets of Zimbabwe or the other third-world troublespots that we see so so regularly in the news. But they are deteriorating and will start to look that way before too much longer. In the Mercury of December 2, 2008, the Mercury’s Idler columnist reports having been to the Cobb Inn on the wild coast for a couple of days holiday. He notes that he saw what he believes to be an illegal trawler operating just off the coast at night, without any navigation lights. He reports that the locals say that this is a regular occurrence. I have mentioned in these pages before, the controversy involving the Navy’s desire to order new vessels for coastal patrol, which comes in spite of their recent acquisition of four frigates, which are apparently not suitable for the purpose. The Mercury of December 3, 2008, reports that, in a speech by the chief of the Navy on the previous day, it was announced that the Navy intends to buy six additional patrol vessels valued at nearly R2 billion, and also a strategic sealift and sustainment vessel. The acquisition of these items will apparently put the South African Navy on track to becoming the continent’s most formidable naval force. I’ve asked the question before, and no doubt will again, exactly what enemy it is that the Navy was expecting to fight. In my opinion, the new patrol vessels are probably exactly what was needed in the first place and that there was absolutely no need to buy the very expensive and highly sophisticated frigates which, according to some reports, the Navy can’t afford to run anyway. Those who ordered the frigates must have received some benefit and/or been so determined to strike a pose that they were quite prepared to waste R6 billion of our money. There may be one good item of news in all this and that is that the local ship building industry may receive a benefit from the order for the new vessels. The paper also reported that, once again, a tall vehicle has come to grief when trying to go under the low bridge which carries Greville Racecourse over the roadway. There is a wonderful picture of a military vehicle which had apparently been towing a refrigerated trailer which had beent totally destroyed, when it tried to drive under the low bridge. The picture shows Samil 50 vehicle, which had apparently just fitted under the bridge, and the wrecked trailer lying behind. According to the Mercury of November 26, 2008, it seems that Durban’s bus service is again in trouble. Municipal manager Michael Sutcliffe was reported as telling a committee meeting that the Durban transport operator will not be receiving a subsidy from central government for the period January 2009 to March 2009. The amount of money that was due to be paid to the bus operator is by central government was R46 million and, according to a company spokesman, the company won’t be able to operate without it. Both central and provincial governments have said that they don’t have the funds to cover that amount and it’s beginning to look awfully as if the city is going to have to cough up the money in addition to the 40 million that it will already have to pay the bus company Remant Alton. According to the Mercury of December 1, 2008, it seems that things are hotting up in the court case which has been brought by the opposition parties in the Durban Council to the street renaming which took place recently. The leader of the Democratic Alliance John Steenhuisen, and city manager Mike Sutcliffe have apparently been trading insults in the court papers. Steenhuisen called Sutcliffe “nothing more than an ANC lackey”. The opposition are bringing the case in an effort to get the renaming reversed and, of course, the city and its ANC leadership, in the form of her Michael Sutcliffe, are vigorously opposing the move. One of the most controversial of the street renamings was when Kingsway in Amanzimtoti was renamed after Andrew Zondo, who had set a bomb at a shopping centre in the town, killing a number of innocent civilians. The Mercury of November 25, 2008, reported that the Durban bus service could come to halt next January. The bus operator Remant Alton has apparently not receive national transport subsidies from December to March. The company apparently gets R11.5 million per month and will therefore be R46 million short over the festive season area. Erik Moller, deputy head of the city’s transport authority, admitted that it was a big problem said he believed that the best solution would be if the money came from the National Treasury or that the province could come to the assistance of the company. The current municipal subsidy of R10 million was apparently still be paid to Remant Alton by the municipality. In other news, it appears that contestants from the Miss world 2008 competition will be in town for a couple of days, starting on Wednesday, November 26, 2008. 112 contestants will apparently be in the city for photo shoots on the beach and at the Beverly Hills Hotel, before proceeding to Johannesburg for the competition. Hope they don’t get ill swimming at our non-Blue Flag beaches! The paper reported that Enden Refinery should be back in operation by mid-January after a disastrous fire shut down the installation two weeks ago. The fire was apparently caused by mechanical failure on a pump. The convoy was apparently on the way to fetch MEC for Social Welfare Meshack Radebe when the incident took place. The policeman has apparently been arrested and charged with 12 counts of attempted murder arising from the incident. I have mentioned blue-light incident before in these pages and this is just another one in a long list where the bodyguards of VIPs and prominent people feel they have the absolute right to push all traffic out of the way from in front of their convoys. They do not appear acknowledge any accountability for their actions and I’m sure that one day, quite soon, we are going to have an even greater tragedy when people are actually killed. The Independent Online reported on November 15, 2008, that a freak storm had torn through residential areas in Molweni and Link Hills near Durban, and had damaged hundreds of low-cost houses and killed at least eight people, leaving thousands homeless. An emergency rescue worker reported he’d never seen such devastation in 35 years of providing emergency services. I went out yesterday morning to have a look at the path damage that the storm cut through the Link Hills area, which is very near my home. I was shocked at the scale of devastation and the evident power of the storm. Sturdy pine trees had been twisted and snapped off halfway up their trunks and the roads were littered with fallen branches and trees. Many residents were trying to clear the wreckage from their properties and many of the houses had missing tiles from their roofs. As I walked through the area, the sound of power saws filled the air as people tried desperately to clear away the wreckage from their properties. The Engen refinery in Durban will be closed for four weeks after a fire, according to the Mercury of Friday , November 14, 2008, which reported that a fire had broken out the day before and is likely to cost the company more than R6-million per day while the repairs, themselves, are expected to cost more than R50-million. The fire broke out after midnight in the unit which feeds crude oil into the refinery’s processing units and was put out by 3:10 a.m. in the morning. This fire is the fourth at the refinery in two years according to general manager Willem Oosthuizen. Last year in November, R120-million was lost when a tank containing petrol 7.5 million litres of petrol was struck by lightning.